On the night of the shower, go outside around 2am. Look eastward, toward where the sun has been rising, and halfway up the sky, along the path the sun takes. 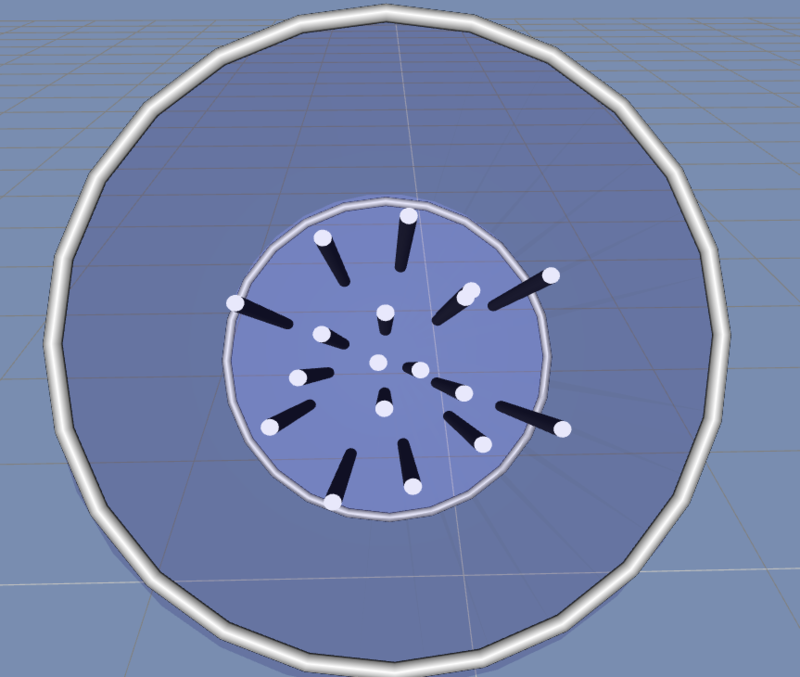 That's the center ('the radiant'). Further away from this point the meteor trails will be longer. That’s it. The rest of this post is just my rambling about the geometry (or astrometry as it were) that makes this all work. You won’t need it. If you come out sooner, around midnight, the radiant will be close to the horizon, and as it gets closer to sunrise the radiant will be almost overhead. If you study the pattern of meteors in the picture above, it looks like we are flying through a bunch of stars very quickly, and that the center point where all those stars appear to be streaking from is simply the direction that we are flying. It turns out that is exactly what you are seeing. The center point (in the upper left quadrant of the picture) is called the Radiant of the meteor shower, and it is the current direction in which the earth is moving, as it travels along its orbit around the Sun. Here is a (simplified) picture describing the general situation. To keep things simple, I’ve put the little guy (who’s supposed to be us) right on the earth’s equator, around 3am his time. We are looking down at the earth from above the North Pole, and the earth is rotating counter-clockwise on its axis. Meanwhile, the earth is travelling around the sun at 18.6 miles a second, going from right to left in the picture. The comet dust in the picture was left behind by a comet years before, and now is for the most part not moving much. 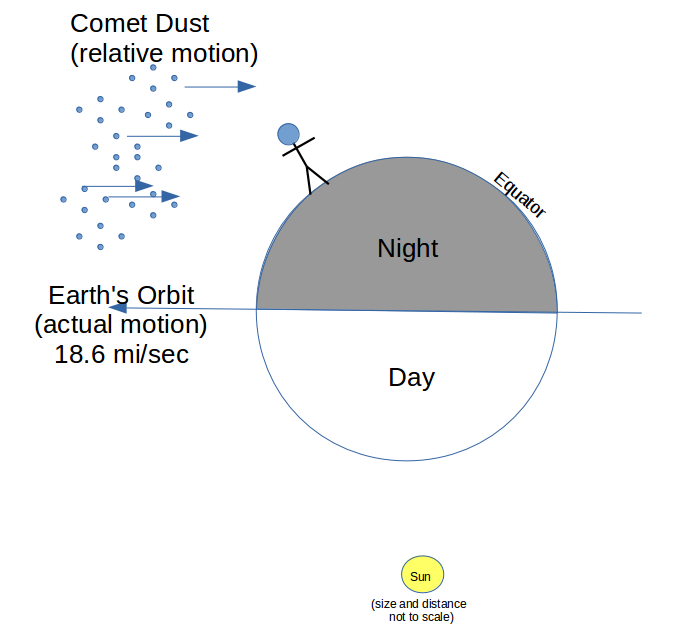 The earth however is plowing through the dust trail at 18.6 miles/second, and so the relative motion of the dust to the observer is likewise 18.6 miles a second, or about 30km/s. Now a Joule is the amount of Energy to drive a one Watt light bulb for a second, which is about how long a meteor flare takes. So the light that our quarter inch piece of iron is putting out during that second is close to a half a megawatt of power. Impressive. So here is a much closer picture. We’ve now rotated the picture so that the little guy is on “horizontal” ground, and we only see a small slightly curved part of the earth. The atmosphere is a very thin shell not more than 70 miles above the earth (1 percent of the earth’s diameter), and the shaded part is what the little guy can see from where he’s standing. 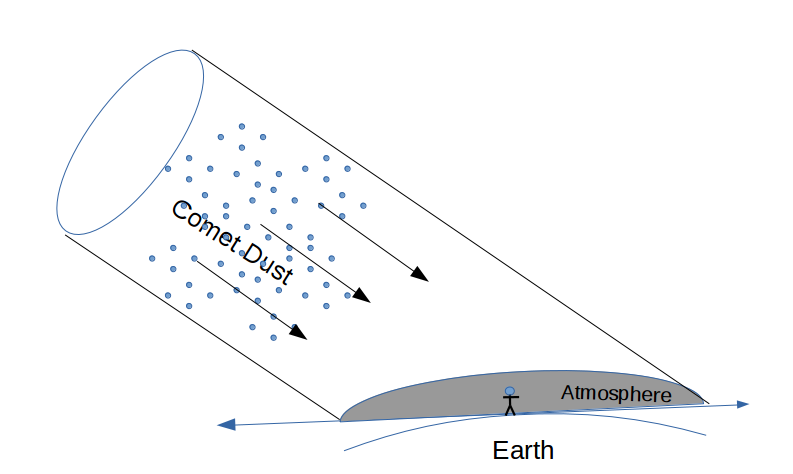 It is a flat lens shaped piece of atmosphere, and the comet dust is coming in at about a 45 degree angle, about to slam into that circular lens. I’ve drawn a cylinder around all of the dust that will hit the part of the sky that the guy can see. Which looks just like the photo of the Geminid meteor shower. So, the reason that showers look like rays flying away from the Radiant is simply a matter of perspective, and the Radiant itself is just the direction that we are are flying, along earth’s orbit. 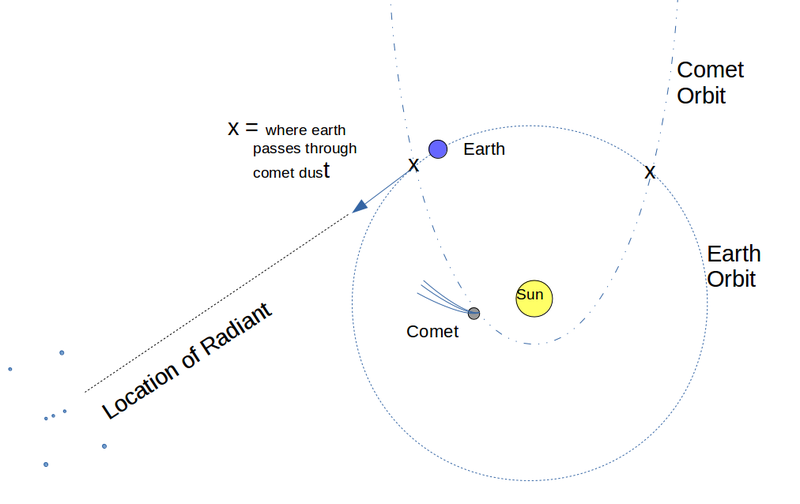 In the case of Halley’s comet, the diagram shows how the orbit of the comet may intersect the Earth’s orbit in two places. In the current picture, the Earth is passing through one of the intersections, and is going in the direction of the constellation Orion (bottom left). This is the Orionid meteor shower, which this year (2016) will be visible from October 2 to November 7. The other intersection occurs when the Earth is heading in the direction of Aquarius, which happens around May 5-6, during the Eta Aquarid’s meteor shower. Not all comets have orbits which intersect Earth’s orbit twice, but Halley’s does.